Though she doesn’t yet have the credentials M.D. behind her name, Saint Mary’s rising senior Kynzie Smedsrud is already collaborating on potential lifesaving research — research that could one day help women fighting breast cancer. Smedsrud’s summer internship at Gundersen Medical Foundation’s Kabara Cancer Research Institute is giving her a hands-on experience that is far exceeding her expectations. A biochemistry major from Luverne, Minn., Smedsrud is a Saint Mary’s University Fellow at Gundersen, an academic collaboration brought about through 1958 alumnus Dr. Jon Kabara (now deceased) and his wife Betty, founders of the Kabara Cancer Research Institute in La Crosse, Wis. Using a variety of techniques, Smedsrud is working in the lab and researching the effect that breast cancer treatments have on a novel fusion gene. “I’m gaining experience with a lot of firsthand advanced techniques that there just isn’t enough time to do at Saint Mary’s,” she said, adding that some of her labs can take up to eight hours, much more time than is available during a regular course’s lab period. As a side project, Smedsrud has also had the chance to work on some plasmid engineering as well. “I never thought I’d be able to say that I’ve cloned a gene,” she said. The experience at Gundersen is giving Smedsrud an opportunity to see what choices she has as she looks toward her future. Smedsrud intends to apply to medical school this fall, a dream she set her sights on in the ninth grade, and will hopefully start continuing her education the following year. “This internship is incredibly important on the path for getting into medical school,” she said. Smedsrud hasn’t decided what area of medicine she wants to specialize in yet, but this internship has shown her potential options. 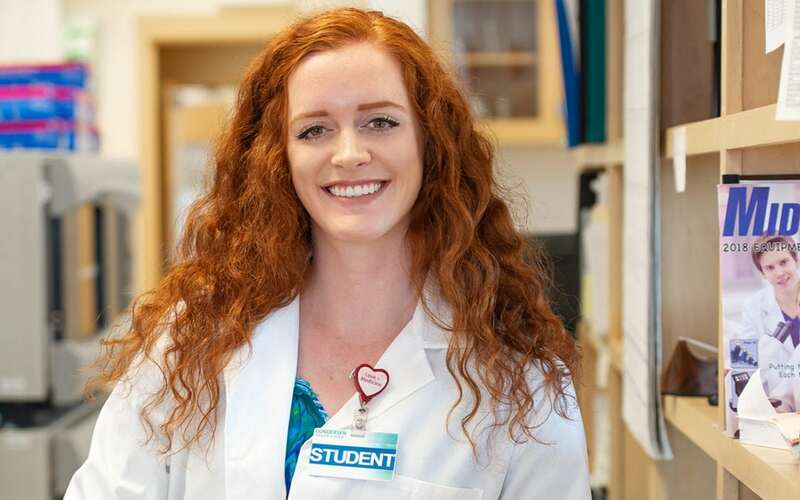 She credited Dr. Debra Martin’s Biochemistry lab course with preparing her for this internship the most, although she noted that she had valuable hands-on chemistry courses as well. Saint Mary’s professors in general gave her the “preparation and basic knowledge,” in addition to the practical ability to give solid scientific presentations and maintain an organized lab notebook — skills and knowledge that she is using to fuel her success now. Just as Saint Mary’s prepared her for the internship, thanks to the internship, Smedsrud may very well have a head start on her biology courses next year. The internship is giving Smedsrud a deeper knowledge of cancer, something she admits she didn’t fully have prior to her internship. “I didn’t really know much about cancer coming into this fellowship. All I knew was that it’s a terrible disease and detrimental to so many people,” she said.